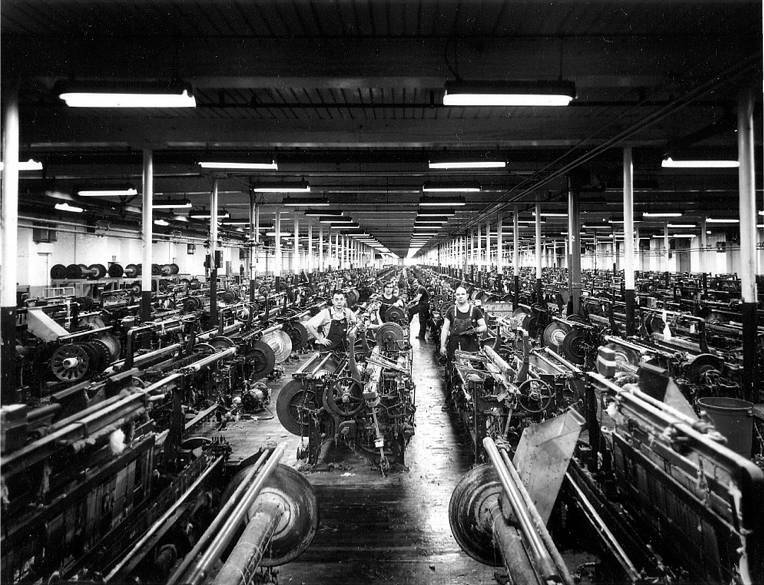 "None of the manufacturing towns of New England pleased me so much as Manchester, in New Hampshire. Unlike its great godmother, it has clean air, clear waters, and sunny skies. Almost every street is an avenue of noble trees." Not until one has passed over one of the pretty bridges and penetrated through the waterside building to the court beyond does one begin to appreciate the enormous extent of these simple, stately buildings. 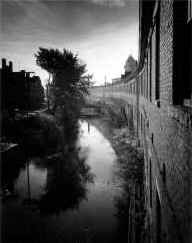 Behind the riverside pile there runs a courtyard so long as to be more like a private road, and on the other side of this road stands another line of mills, parallel with the curve of the first, so that one cannot see to the end of them. 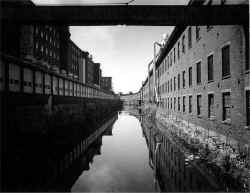 'When Samuel Blodget, who had built a barge canal around the Amoskeag Falls in what was then the town of Derryfield, announced in 1807 that "For as the country increases in population, we must have manufactories, and here at my canal will be a manufacturing town the Manchester of America!" 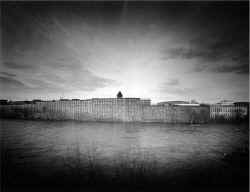 It is doubtful that even he had any idea of the scale of the complex which would eventually be built around his canal. 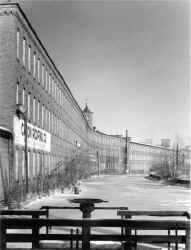 In 1838, the laying out of the New Town and the construction of the first mills began. 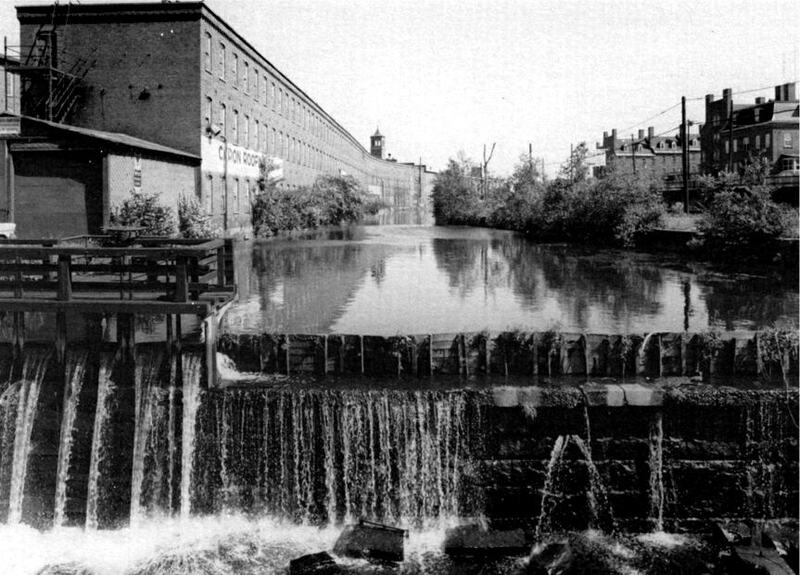 The magnitude of this effort can be sensed when one observes that the two granite-lined canals were constructed to their entire one-and-one-half-mile length before the first mills were put into operation. At the very start waterpower was thus provided for a strip of land large enough to serve the needs for half a century- until the, introduction of steam and electric power made them unnecessary. The Amoskeag company turned a village of 125 inhabitants into a city of 10,000 in 10 years, and went on to become the largest textile manufacturing plant in the world, turning out cloth at the staggering rate of 50 miles per hour by 1915! The Amoskeag Millyard bridges the Industrial Revolution, tying the simplicity and classical unity of the New England Colonial town with the dynamic intensity of the modern industrial city; combining in its fabric the pastoral dignity of great barns with the urban density of a European market place. It was built with a mind to the needs of the working class before there was a significant working class in this country to make that effort a self-conscious one, and it was laid out and designed to answer those needs before Le Corbusier had philosophically stripped the "urban" from urban design, or Frank Lloyd Wright had rejected the need to build cities altogether. 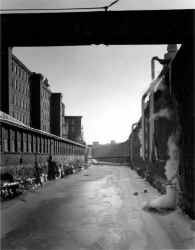 The Amoskeag Millyard, even in the smallest details, achieves an extraordinary unity of design, unfamiliar to us in this day of limitless materials, which force us to choose instead of to create. Perhaps the handsomest, certainly the most impressive, buildings in Manchester are the Amoskeag and the Manchester Mills. They are not ornate ornate mills are of ten hideous - but they are built of a warm red brick, beautifully weathered, and form a continuous curved facade (like the concave side of Regent Street in London), nearly half a mile long. Rising shear out of a deep, clear, swift-flowing stream, upon the other bank of which are grass and trees, they need little more than to be silent to masquerade successfully as ancient colleges. The design of the Millyard segregates rail, truck and pedestrian access with an ease and clarity that makes some of our more celebrated contemporary efforts in this direction seem self-conscious and confused. 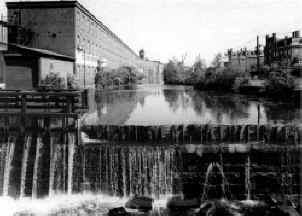 It consists of two canals parallel to the river providing power to the mills in between. The primary unit within the design was the single mill on one side of the canal and six blocks of housing directly opposite. 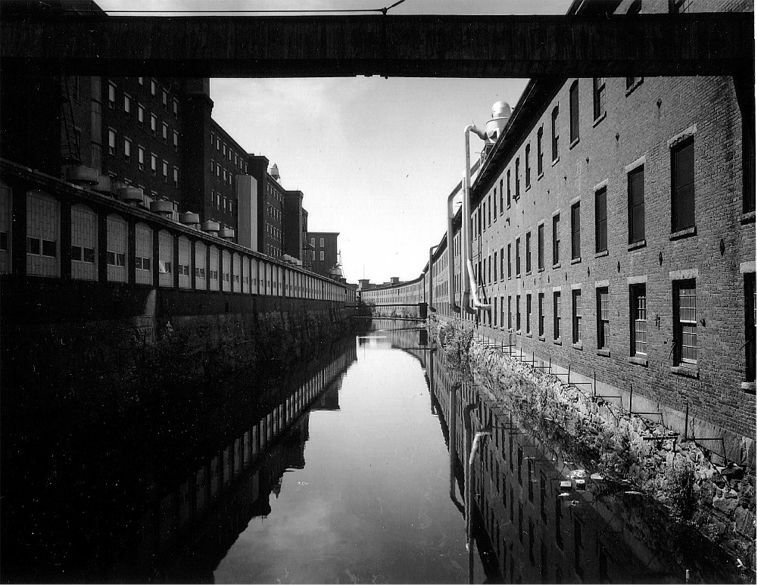 These units acted as links in an ever- lengthen i ng chain as the Millyard expanded in both directions along the canals. The trains and trucks were able to run unrestricted for the length of the yard between the mill buildings out of sight and hearing from the housing and the city center, while the workers crossed the canals to the mills directly opposite their houses. 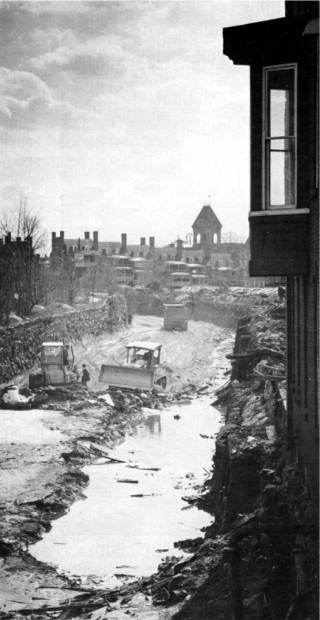 The Millyard development became a great urban design when the secondary buildings, containing the company offices, shops and storage, were joined together to form a regular and continuous wall facing the moat-like canals, between the mills and the city. The entrances to the millyard are across bridges and through archways in much the same, way as in an English cathedral close. 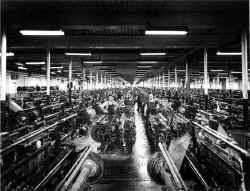 Both the mills and the workers' houses are stylistically conservative for their times, and, except for a few examples of high Victorian fantasy in the towers and gateways, the buildings are remarkably plain. 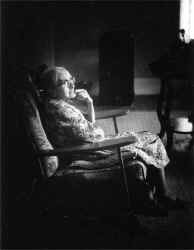 The reason for this restraint in the design of individual buildings becomes, apparent when one enters the complex. 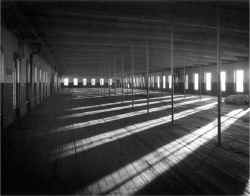 No structure stands isolated or distinct even though the construction and reconstruction of the mills progressed over a period of 75 years. Instead, the dense and continuous mass of red brick buildings flow together into a unified and organic whole, with highlights provided by the towers which rise above the complex, giving focal points, not to single buildings, but to the whole urban form. 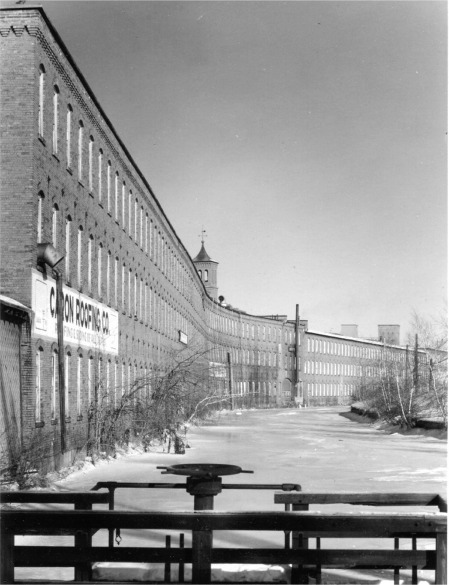 The mills in Manchester are distinguished in comparison with those from other New England milltowns because they were all planned and built by the engineering department of one company. It is this unified planning control that is the primary reason for the coherence and consistency of its design. The architecture is a corporate architecture, using the design elements of an age, rather than one individual's creative expression. 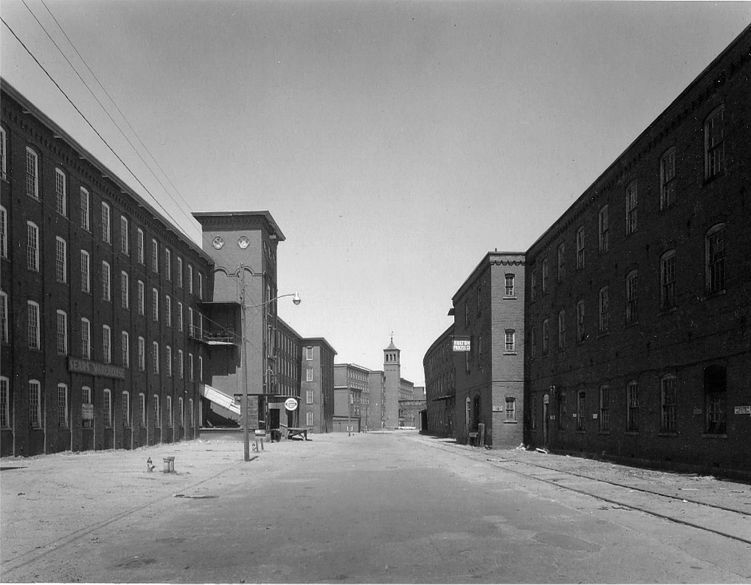 The "River Facade" of the Amoskeag Millyard, 1968. 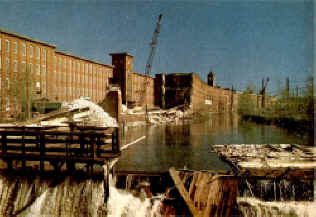 The most recent demolition in the millyard - in about 1995 - the critical portion of this facade - the mill along the river in the center of the photograph, was demolished leaving a gap in the facade right where it formed a prow when viewed across the river. 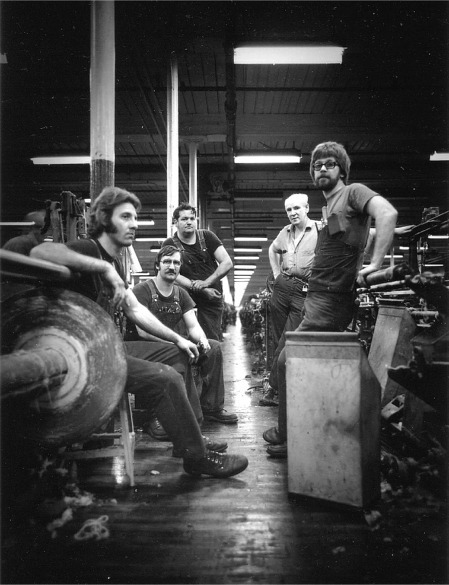 On Friday, March 7, 1975 at 11:00 p.m., the Chicopee Manufacturing Company, which was located in the "Coolidge Mill" of the former Amoskeag Millyard, stopped its looms as it had done so regularly at that hour since the time when the night shift had ceased several years before. See the AMOSKEAG EXHIBITION page for a commentary with these photographs on that event. 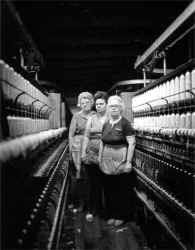 "But it's sad, because, like I said, you go down the aisle and you say I used to have all those looms to fill, and, you know, you just don't have anything. It's very sad, real sad ... now it's so empty." 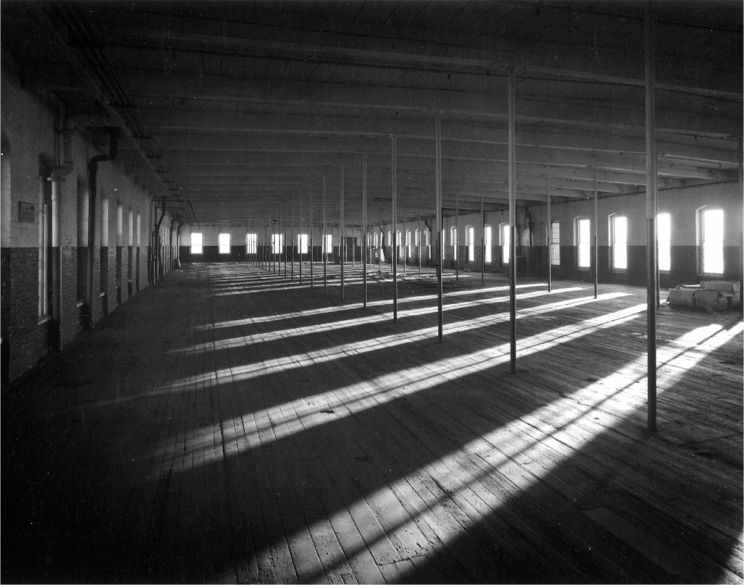 A view in top floor of the Stark Mill #3 of the Amoskeag Millyard taken the evening of the day before it was demolished. "A time will come when the science of destruction will bend before the arts of peace; when the genius which multiplies our powers, which creates new products, which diffuses comfort and happiness among the great mass of people, shall occupy, in the estimation of mankind, that rank which reason and common sense now assign it." 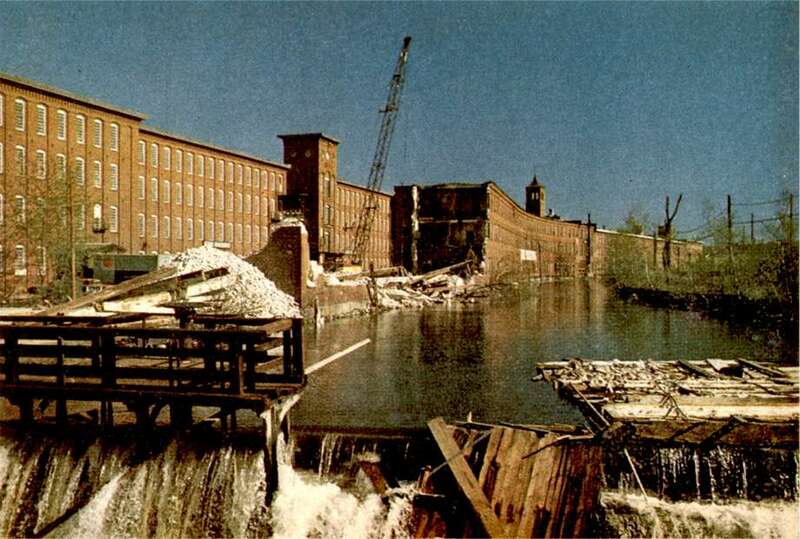 From 1968-until into the 1990's demolition of mills and canal buildings in the Millyard continued until all of the canals were filled in, the curved canal buildings along them were demolished, and many of the mill buildings and most of the river facade were demolished as well. Here is an example of the change when first the upper canal building was demolished, and then the canal was drained and filled in.